As we may have said before, Japanese landscapes just wouldn't be complete without concrete and wires. 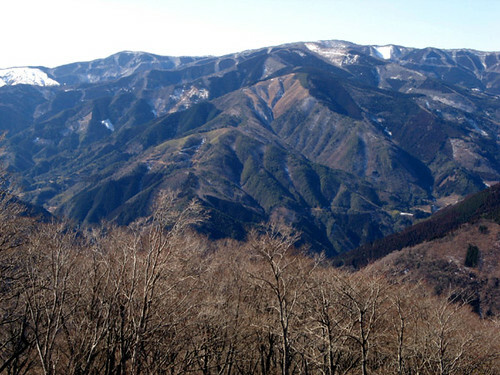 And so it is too in the Sekiryo Mountains. Of course, roads and electricity are needed wherever people live, but what saddens us is the extent of wastefulness here. It seems that the ubiquitous scars on the landscape fill the needs of the constructions companies a lot more than those of the citizens. And as is usually the case, the environment pays the ultimate high price for a society's excesses. It is a well known stereotype that creativity is not a typical point of modern Japanese society. Instead the focus is on thoroughness, ingenuity, and attention to detail; this has indeed created the niche that has made Japan one of the strongest economies in the world. It's also reflected in the general look of the country's landscape, for better or worse. But evidence of spontaneous art occasionally does pop up in the strangest of places, such as this concreting job. Here it seems the ancient art of the Japanese rock garden, or iwagumi, has made a transcendant reappearance. 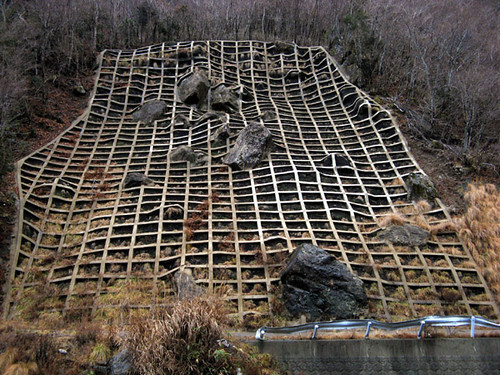 As the condition of the guardrail (itself seemingly a wabi-sabi element of the scene) shows, this creative reinforecement has apparently not reduced the hazard of falling rocks. But it catches the eye: if there wasn't so much of this stuff around, it might not even be considered an eyesore. Yet another concreted acre of the mountainside, this one with a carefully executed 3-D feel. Although solid-looking, slope reinforcements like this are really a dynamic part of the war against nature; we have seen one that had detached itself from the mountain wholesale an slid down, obliterating the road and coming to rest like a giant crumpled rug on more level ground below. Far from seeing the futility of building upon unstable dirt slopes, man will not admit defeat and will invariably counter with something even bigger and uglier. 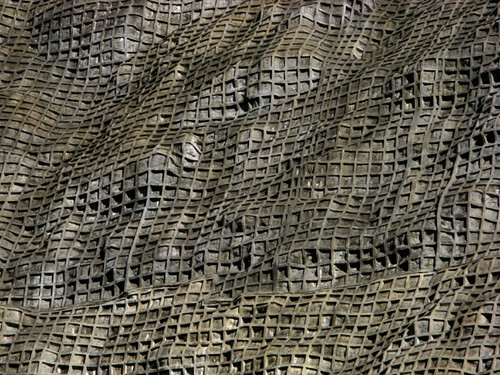 These interestingly modeled canyon walls, however, do look like they will stay put, if only due to their sheer mass. 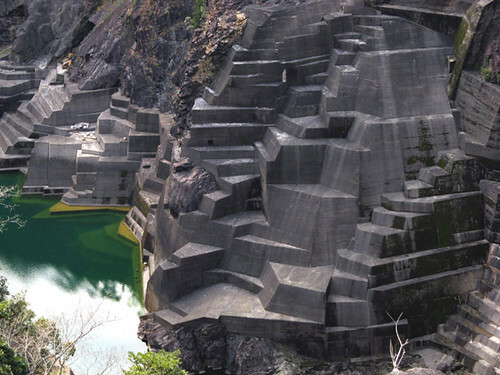 Located just under the massive Hitotsuse Dam, they supposedly reinforce the crumbly bedrock around it. As one can imagine, dams are a favorite in Japanese infrastructure building, and all kinds of reasons are offered up to justify the continuing construction of new ones. 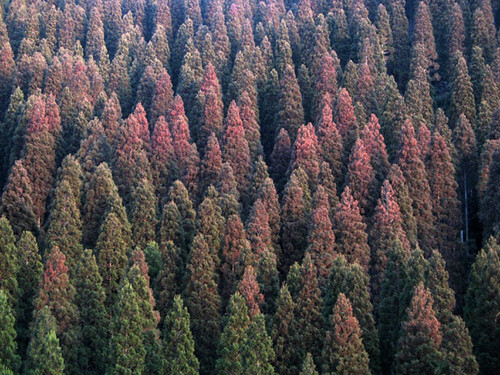 Sunrise casts magical colors upon a neat stand of cryptomeria trees. Judging by the age of most of these plantations, about 40 or 50 years ago there must have been an insane time where in a space of only a few years, something like a third of Japan's natural forests were cut down and replaced with this main source of native lumber. At a slower rate, the process continues today, justified by the belief that every piece of land is wasted unless put to financial profit. But a host of related problems has surfaced, including erosion, droughts, and pollen alergies. The trees produce copious fine pollen in wintertime, which, carried far by the winds, has no trouble infesting even the centers of cities like Tokyo. About a third of Japan's population is affected by the resulting hay fever and makes recourse to drugs. This obviously benefits the drug companies and the construction machine too is kept busy stemming the erosion and building maintenance roads. The drought problem is addressed with new dams. Look at it this way, and the grim picture of the country's internal workings begins to emerge even from this outwardly peaceful forest scene. Entire mountains have fallen to the spread of plantations, giving this kind of sad, worn out look to what must once have been a beautiful scene. Although Japanese houses are inexplicably torn down and rebuilt every 20 years or so (yet another piece of the puzzle), lumber must still be in oversupply because many plantations are not adequately maintained and their trees will eventually go to waste. Complete this picture with rampant propaganda of how planting trees (read: cryptomeria) is good for the greenhouse effect and so on, and one can begin to appreciate the frustration that universally encroaches here on one's hiking enjoyment. Wow, scary road. Do the drivers coming from the other direction get any warning? Might not be a good outcome for someone coming fast around the corner. Yikes! Indeed. 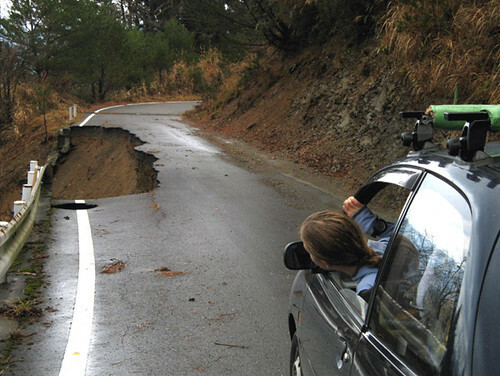 Of course, in the hills washouts are so common only a suicidal maniac would drive around a curve fast enough to not be able to stop for whatever lay behind it. This simple fact keeps Darwinian elimination to a bare minimum. However, a scene from the anime "Heisei Tanuki Wars" does come to mind. See it if you haven't already; it's my favorite movie ever, and right on topic here.